Star Wars: Battlefront II is under a lot of strain. Setting aside the loot crate debacle from the beta ( which is hopefully being improved ) there’s the Bantha-in-the-room known as the canon. 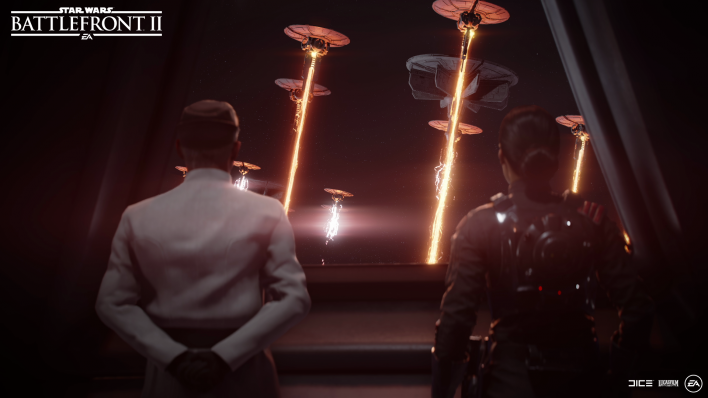 Canonical Star Wars content is a big, big deal no matter where it appears, but Star Wars: Battlefront II represents the first time narrative elements appearing in a video game are meant to inform the rebooted franchise at large. And if you take nothing else away from this hands-on piece, know the plot for Star Wars: Battlefront II looks to be appropriately compelling and reverent. But the game itself? That’s another story. My demo consisted of the first three chapters of the single-player campaign: The Cleaner, Battle of Endor and The Dauntless. And while the story surrounding each chapter held up, I’d rather not spoil too much here. 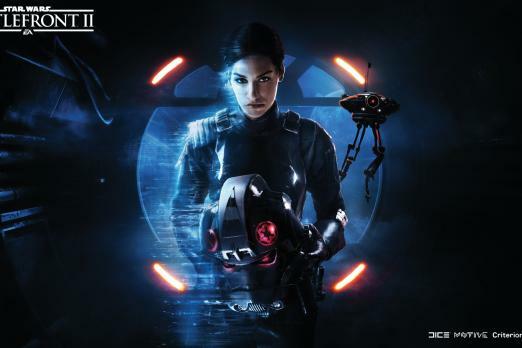 But if you’re interested in seeing an amazing new Imperial character (Iden Versio, perfectly performed by Janina Gavankar) in a unique plotline, you won’t be disappointed. The care in the writing also extends to the production, as the CGI scenes looked exquisite. Although, it is worth noting the demo was on a PlayStation 4 Pro. How these scenes look on other consoles may not reflect the level of polish I encountered in the demo. What should remain consistent, though, is Gavankar’s acting and the supporting cast around her (which will, at some point, include Mark Hamill). There's impressive refinement to be found in the environments as well. Particularly impressive is the level layout in The Cleaner, which sees you stealthing around a rebel ship until all hell breaks loose and you have to blast your way out. The tight corners and sloped corridors make for some intense combat settings. In The Dauntless, the space wreckage drifting amidst your fever pitch dogfighting adds an element of unpredictability; a successful attack can instantly shift to a total disaster if you’re not watching your blind spots. On Endor, the forest itself becomes as much a part of the battle as the rebels you’re fighting against, especially when tall trees crash into your line of sight and block what was once a great flanking position. Unfortunately, the combat itself leaves a lot to be desired. Despite EA’s best intentions, the campaign often feels like tedious bot blasting, even on the highest difficulty setting. The AI felt predictable and sloppy. There were many sections where I nonchalantly walked towards a group of rebels and calmly executed headshot after headshot without receiving much pressure in the form of return fire. Rebel officers are considered high-priority targets, but I couldn’t detect much difference on the battlefield when they were present, even though they offer buffs to other enemies. Only one assault portion during the Endor chapter offered me any real challenge. My abilities and loadouts felt similarly useless. There are some gains to be had in switching out the weapons at the various equipment stations on each level, but my special abilities went largely untapped. Again, I played the demo on the hardest possible setting and never felt compelled to use any of the special abilities available, other than the battlefield scanner for tagging enemies. There was nothing to encourage me to try different combos, and no enemies or scenarios that involved the kind of rock-paper-scissors style strategy that would force you to experiment with tactics. Long-distance headshots were the order of the day on Endor, and medium-distance headshots during The Cleaner. Space combat impressed me a bit more, although the controls don’t allow you to bank and spin like you’d hope. It’s hard to describe, but using the throttle and brake to pivot in space felt intuitive early on, and the space fights were, by far, the most fun I had during the demo, and the only thing that left me wanting more. 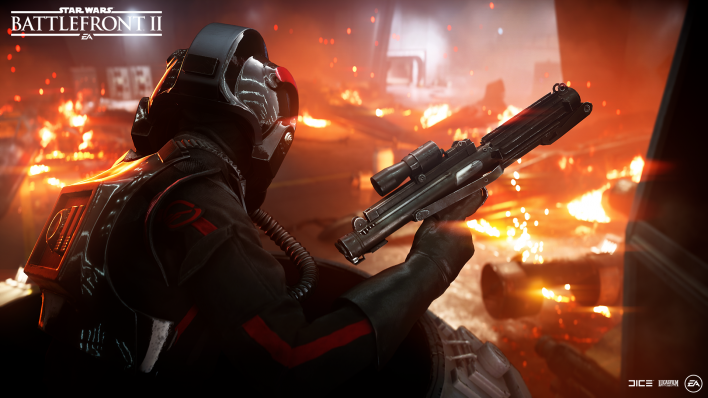 Starfighter Assault may emerge as the most popular game mode in Star Wars: Battlefront II . And since it only took about 90 minutes to get through the first three chapters on the hardest difficulty setting, I’m not setting high expectations for the story mode to sustain me longer than a weekend afternoon or two. Ultimately, the single-player campaign for Star Wars: Battlefront II feels like a half-baked concept. The story is there, the graphics are there, but the combat doesn’t provide any meaningful challenge. There’s no sense of risk in the gameplay, which ultimately undermines the immersion the narrative creates. I understand the campaign is part of a larger whole, and the real focus will be ongoing multiplayer matches and support. But I think Star Wars fans will find the experience wanting, and EA missed an opportunity to make a killer first impression for the single-player Star Wars content it will undoubtedly start cranking out in the years ahead. Editor's Note: A previous version of this story incorrectly stated that the demo occurred on a PC. It was done on a PlayStation 4 Pro and the article has been updated to reflect this correction.